This was the first recipe I made from Ina Garten’s new cookbook, which so far is just as amazing if not better than her previous ones. This is a perfect make-ahead meal, since the soup tastes better the next day. I was tempted to add a whole cup of farro, but I’m glad I didn’t since the farro soaks up some of the liquid overnight. You can substitute sour cream for creme fraiche, as make mushrooms substitutions depending on what you can find at the store. 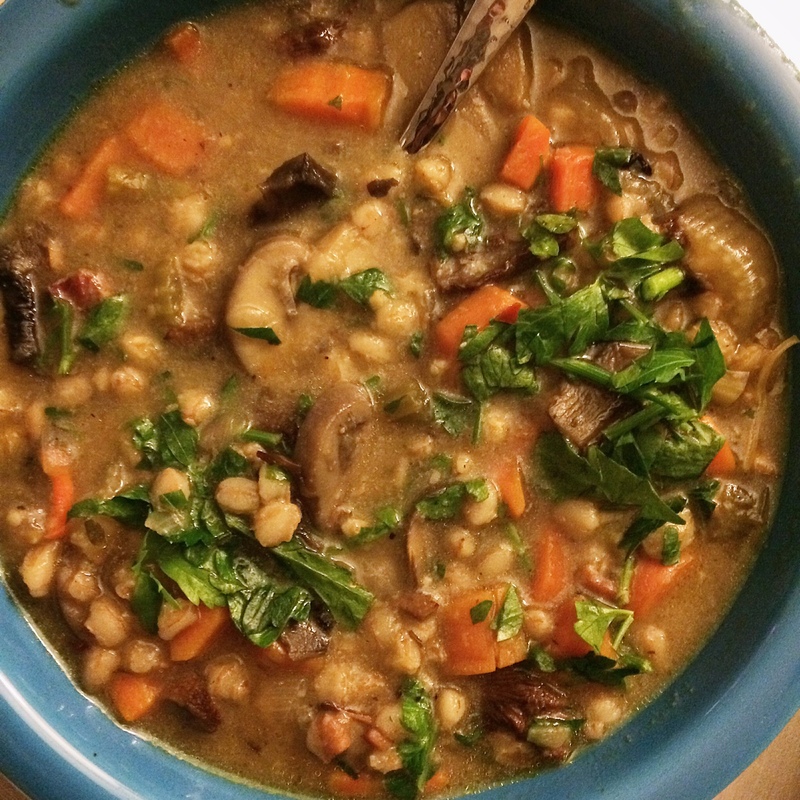 Another substitution I made was I used 10-minute farro instead of pearled farro. 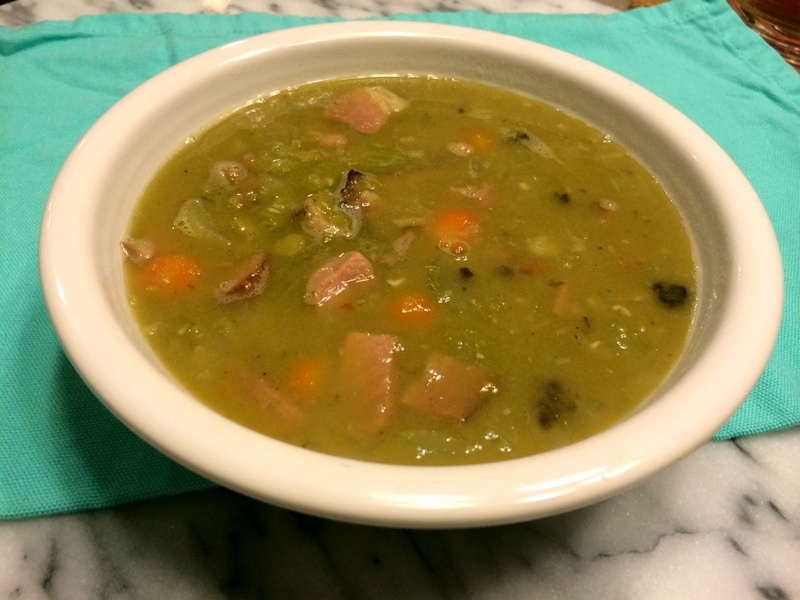 This was a great winter soup, it’s perfect for lunches during the work week! Place the dried mushrooms and 6 cups of water in a medium pot and bring to a boil. Turn off the heat, cover, and set aside for at least 20 minutes. Meanwhile, heath the olive oil in a large pot or dutch oven. Add the pancetta, onions, carrots, celery, salt, and pepper and saute over medium heat for 10 minutes, stirring occasionally, until the vegetables are tender. Add the garlic and farro and cook for 2 minutes, stirring occasionally. Add the fresh mushrooms and the 1/2 cup Marsala and cook for 5 to 7 minutes, until the mushrooms have released some of their liquid. Meanwhile, strain the dried mushrooms through cheesecloth, reserving the liquid. Coarsley chop the mushrooms and add them to the pot, along with the strained soaking liquid, the beef broth, and thyme. Bring to a boil, lower the heat, and simmer partially covered for 45 minutes, until the farro is tender Discard the thyme bundle. 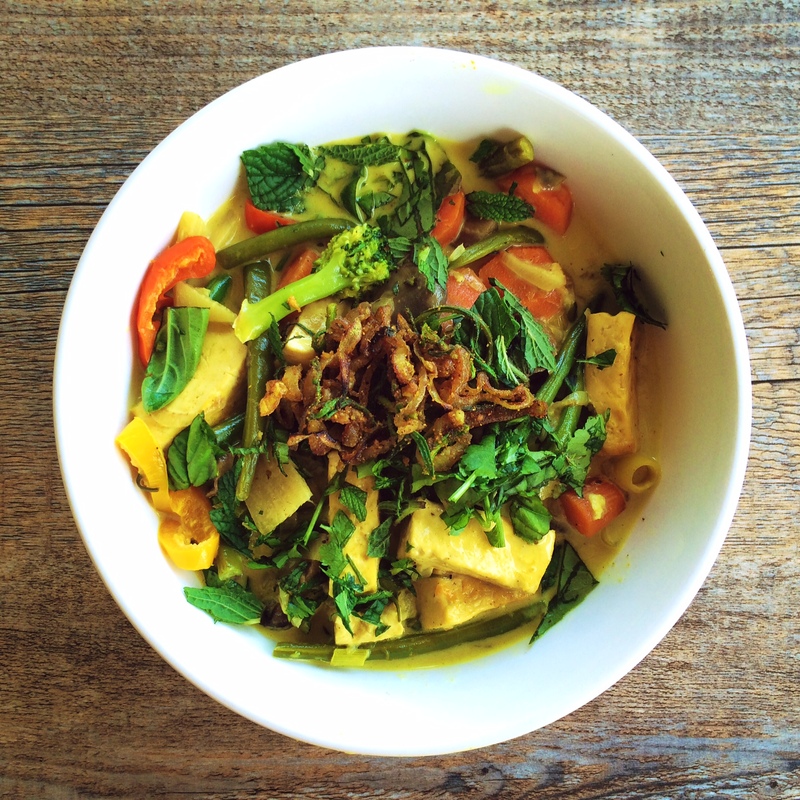 In a small bowl, mash together the flour and butter and stir into the hot soup. Simmer for 5 minutes, then stir in the cream and remaining 2 tbsp of Marsala, and taste for seasonings. Sprinkle with the parsley and serve hot. I knew I wanted to try to switch up my mom’s classic pot pie recipe (the original blog post is old and not the most beautiful) – and for some reason Cajun Chicken came to mind. I decided to add some fresh jalapenos from our garden and swap out some Guinness (or any other stout beer) for cream sherry. 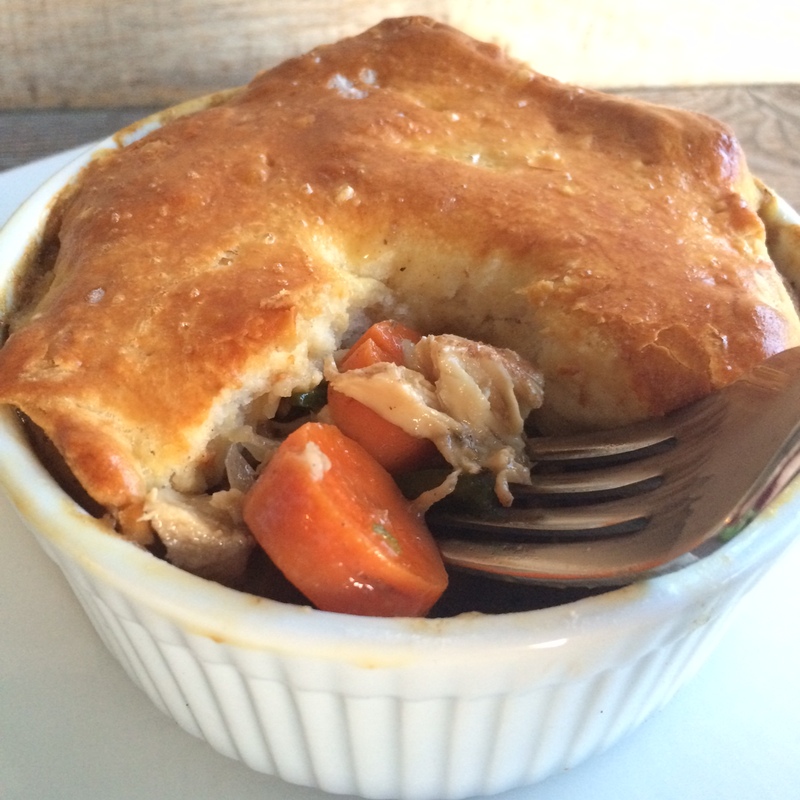 The Cajun-seasoned chicken and Guinness definitely gave the pot pie a darker, more robust flavor – Jordan loved it. I think I am partial to my mom’s way – the use of white wine or cream sherry definitely gives off more of a comfort food factor for me. This time around I used Trader Joe’s canned biscuits as my crust. I rolled out the biscuit dough on a lightly floured surface until they were about the right size to go over the ramekins. Notice from the above photos it was a tad hard for me to cut vent holes – these biscuits were a lot thicker than the canned ones I have used in the past. I probably will stick to frozen puff pastry in the future as I like the thin, flaky crust that bakes up on the pot pies. Recipes revamps are always worth a shot – I like the original, husband likes this one…guess I just started an ongoing pot pie debate? Pre-made dough – Options are endless (frozen puff pastry, frozen pie dough, pizza dough, crescent roll dough, etc). Preheat oven to 400F. Season chicken with some Cajun seasoning, plus a little salt and pepper (I used a cajun seasoning with no salt added). You can use any kind of chicken you want, for this particular recipe I had some frozen chicken tenders laying around so I thawed those out. Skin on, bone on chicken works great too. After seasoning the chicken, put on a sheet pan and cook in the oven until done. Remove from oven, shred chicken, and set aside. Meanwhile, dice the onion, garlic (if using), carrot, celery, jalapenos, and mushrooms. Add a tbsp of olive oil and about a tbsp of butter to a large skillet or dutch oven over medium heat. 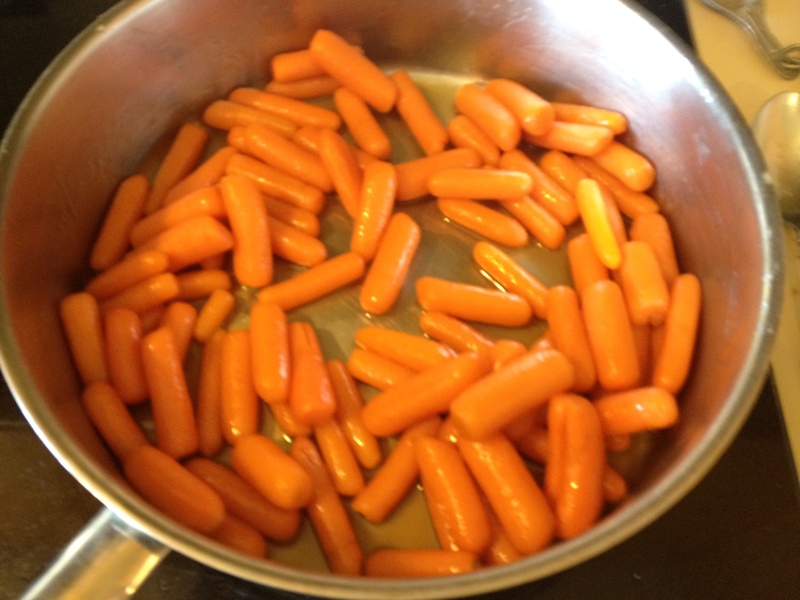 Add the onion and let cook for a few minutes, then add the garlic (if using), carrots, celery, and jalapenos. If you are using the mushrooms, I like to sauté them in a separate pan with some butter, chicken broth, and thyme. Add a little bit of salt, pepper, poultry seasoning, and thyme to the onion and vegetable mixture. 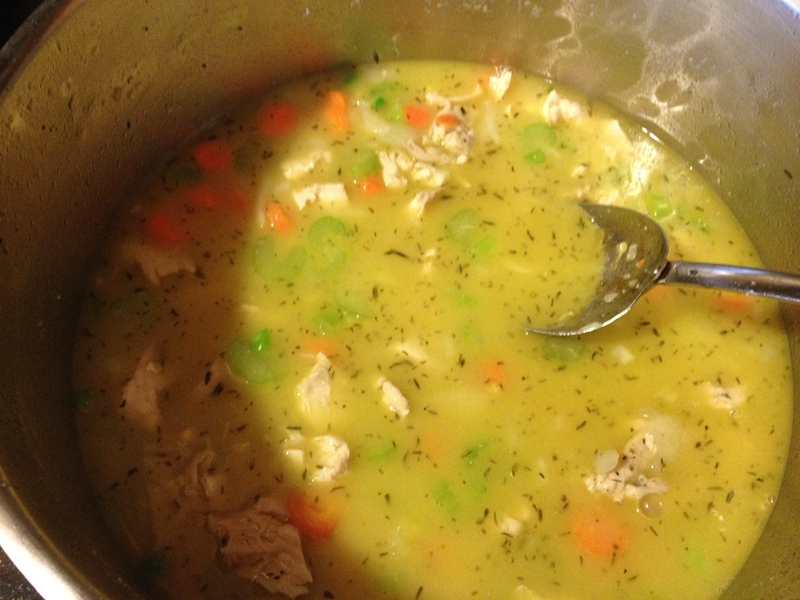 If everything seems dry feel free to add a small splash of chicken broth. Stir. Sprinkle about 1/4 cup of flour over the mixture and stir constantly until the flour is dissolved. The mixture will be thick. Add the beer, a little at a time, until you start getting to the thickness of pot pie that you like. Add a splash of cream and more chicken broth. You don’t want your mixture to be too thick because the crust will soak up some of the liquid. 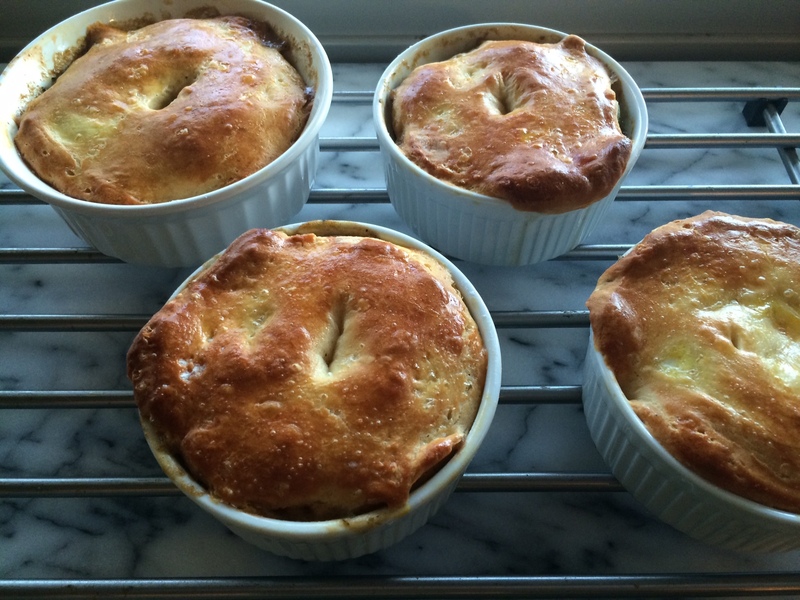 Once your pot pie mixture is the way you like, add the mixture to ramekins or a large pie dish. You don’t want to fill your ramekins up to the very top, you need to leave room for the crust. I almost always make pot pies in ramekins, and depending on what type of pre-made crust I am using (crescent rolls, puff pastry, frozen pie dough, etc) I just roll out and shape pieces to fit the mold. Place ramekins on a large baking sheet and bake pot pies at 400F for about 20 minutes, or until the tops are nice and browned. 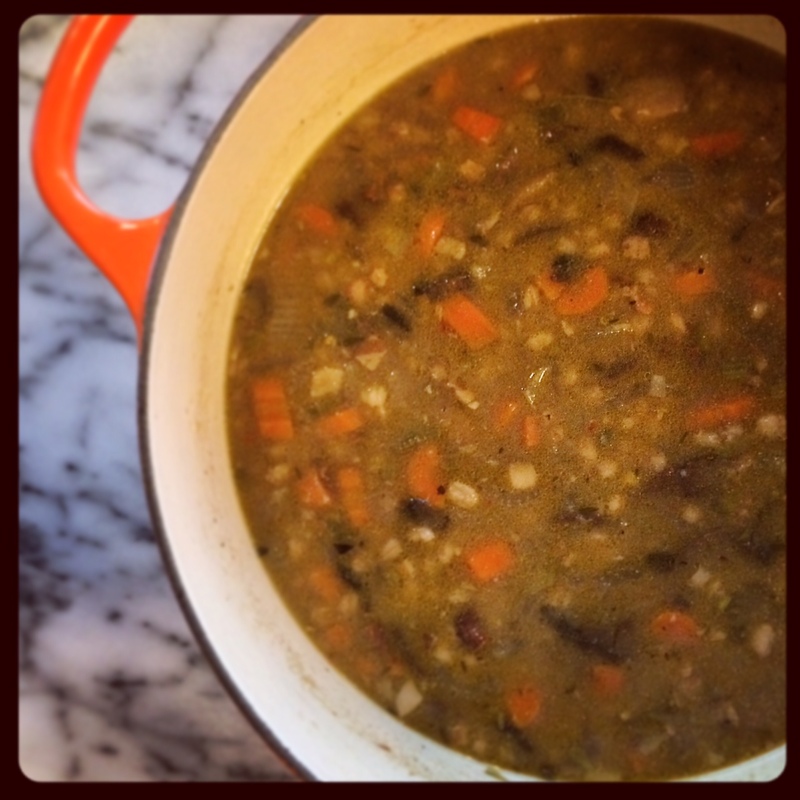 Nothing says Fall like a warm, hearty bowl of soup. 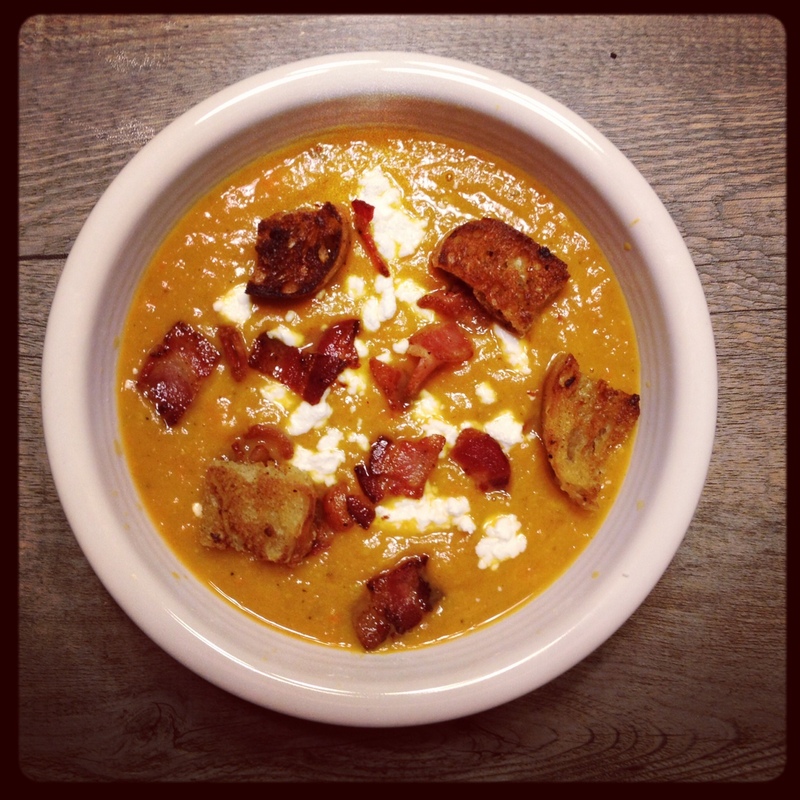 Pumpkin Soup with Bacon and Croutons, however, takes Fall to a whole new level. 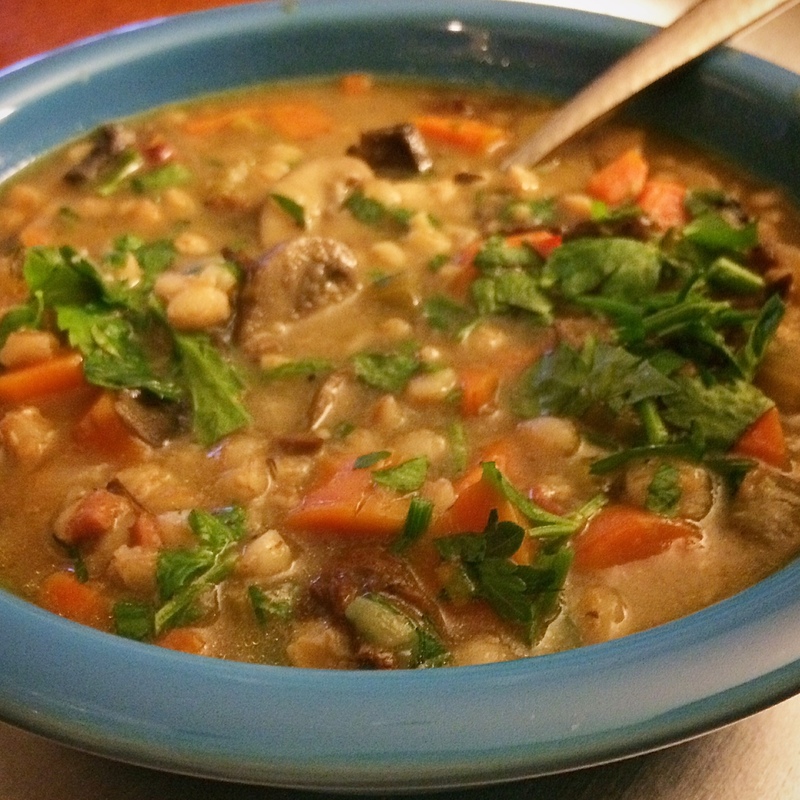 I was blown away with how this soup turned out. Normally I associate the canned pumpkin with sweet treats and desserts, but this soup has changed my mind. I also couldn’t help but think baby food as everything was cooking down (aren’t I super good at convincing you to try my recipes? )…but dammit, it’s a really freakin good adult version of baby food that I would be proud to feed my baby/kids someday (showing them this blog with all the swearing probably won’t be on my list though). Anyways, Pumpkin Soup ended up being a huge success! 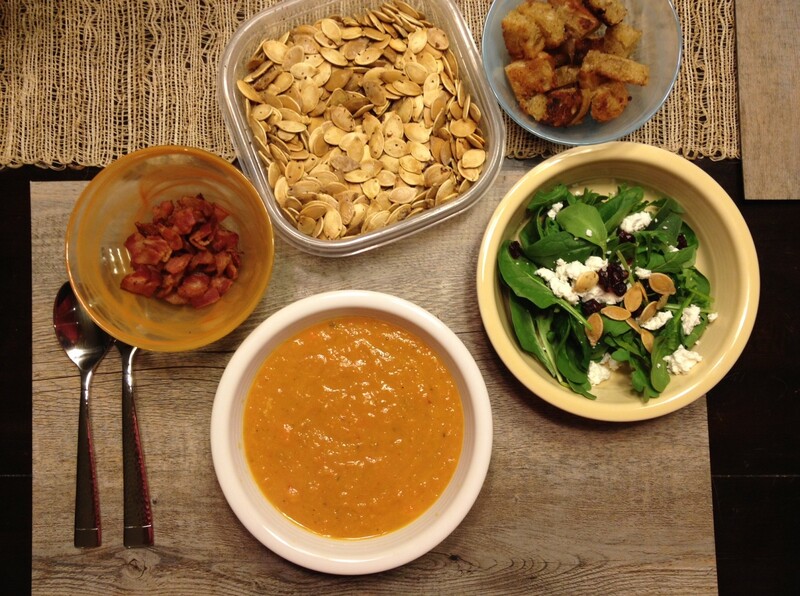 The bacon and croutons are a must – so was the sprinkling of goat cheese on top. Another thing that blew my mind was the soup was even better the next day. I think this soup will become a yearly October tradition in our house. Next time I will likely double the recipe since the soup is great as leftovers. I also see new versions of this soup surfacing in the years to come, and I can’t wait! 1. Heat the oil in a large pan. 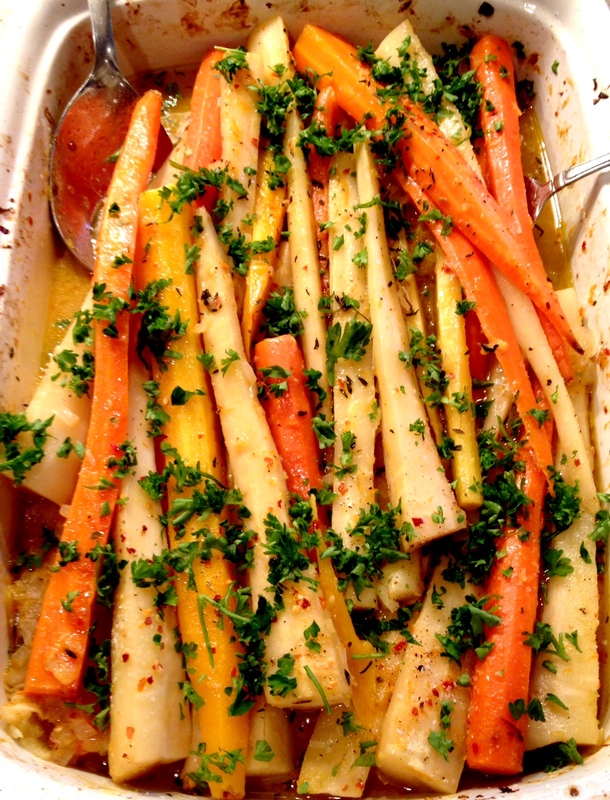 Add the chopped onion and carrots and cook over low heat, stirring occasionally, for 5 – 10 minutes or until softened. Add a few dashes of salt and pepper while the veggies are cooking down. 2. While the vegetables are cooking, dice raw bacon into small pieces and add to a separate pan. Cook on medium until bacon pieces get slightly crisp. Set aside and drain on paper towels. Leave remaining grease in pan for the croutons. To make croutons, cut bread into small squares and cook on medium-low in the bacon pan until brown and crisp. Set aside to drain on paper towels. 3. Add the pumpkin, half of the cooked bacon (about 1 cup), and nutmeg to the carrot and onion mixture, stirring well. Cover and simmer, stirring occasionally, for 5 – 10 minutes. 4. Pour in the chicken broth, increase the heat to medium, and bring to a boil. Reduce the heat and simmer for at least 15 minutes. Add a few dashes of thyme and red pepper flakes, season to taste with more salt and pepper if needed. 5. Remove the pan from heat and let cool slightly. Use an immersion blender to blend up the soup until smooth. If you don’t have an immersion blender, I highly recommend you get one…but transferring the soup to a food processor or blender and blending in batches also works fine. If so, return it to the pan and reheat. 6. 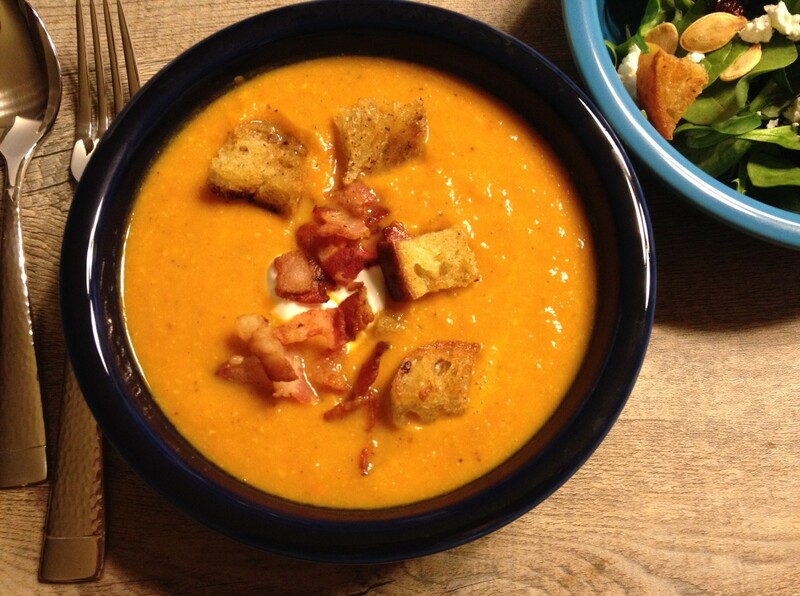 Serve soup with the reserved bacon bits and croutons. Soup is excellent with a few sprinkles of goat cheese on top, or sour cream. Toasted Pumpkin Seeds add a nice seasonal flair as well. Recipes where you truly can just “wing it” are kind of hard to explain. I know my mom probably hates it when I make her dig up an old one she has memorized, or heaven forbid write every detail out in an email to me. After making these Chicken Pot Pies, I get it. They are really easy, and you totally should wing it every time you make it, because regardless they will probably turn out good. My description, however, is quite long and upon first glance it probably does not seem easy because it takes me about 3 paragraphs to explain it. Note to Self: writing out a recipe from scratch like Ina is probably never gonna happen. 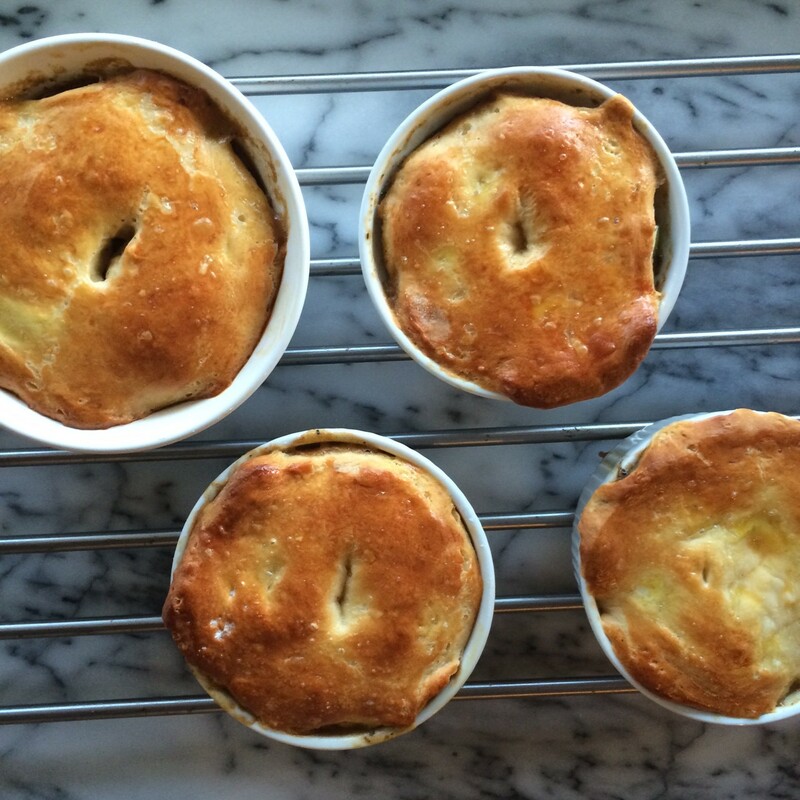 BUT alas, once you make these, you are set on chicken pot pies for life. You can choose to get as fancy or frivolous as you want, I suppose I will make variations on this in the future (buffalo chicken pot pies perhaps?) but for now, this satisfies me and the future-hubs-to-be. Remember, all amounts in the recipe below are relative. you just have to go for it. You may also have round ramekins instead of rectangular ones like me, or you may want to just make it all in a giant pie dish (I however, prefer my own damn personal pie). Mom – thank you for writing everything down for me, and explaining it in a way you knew I would understand. Because, if you didn’t write it all down and expected me to do it from memory off that time we made these together, I definitely would have forgotten the chicken broth, cream, and sherry…AKA the ingredients that hold the recipe together! Use any kind of chicken you like, such as a pre-cooked rotisserie chicken. I marinated boneless chicken tenders in some olive oil, white wine, thyme, salt and pepper. I cooked the chicken over medium heat in a large skillet on the stove. After cooking, I shredded the chicken into bite sized pieces, and set aside. Chop a small/medium onion and start cooking it on the stove in a bit of olive oil and butter. 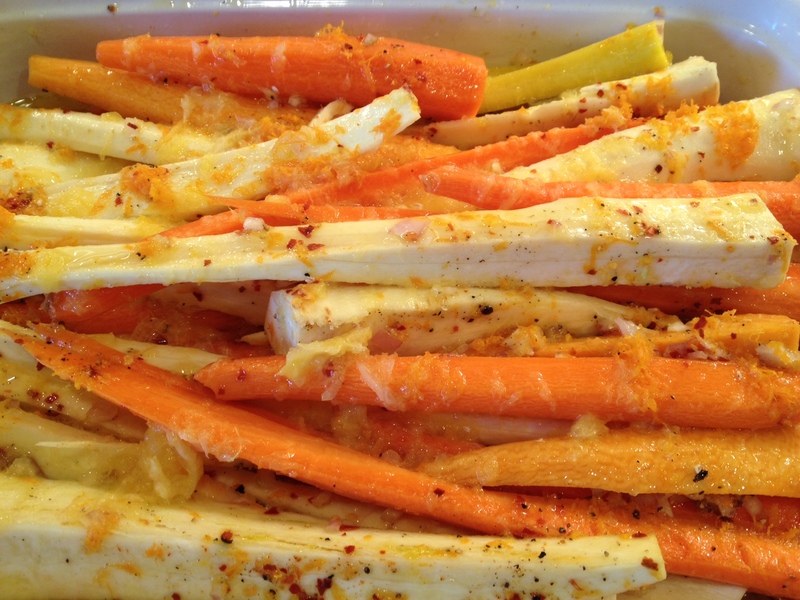 Add some chopped celery and carrots. Don’t forget to add some salt and pepper and a bit of thyme and even some poultry seasoning. 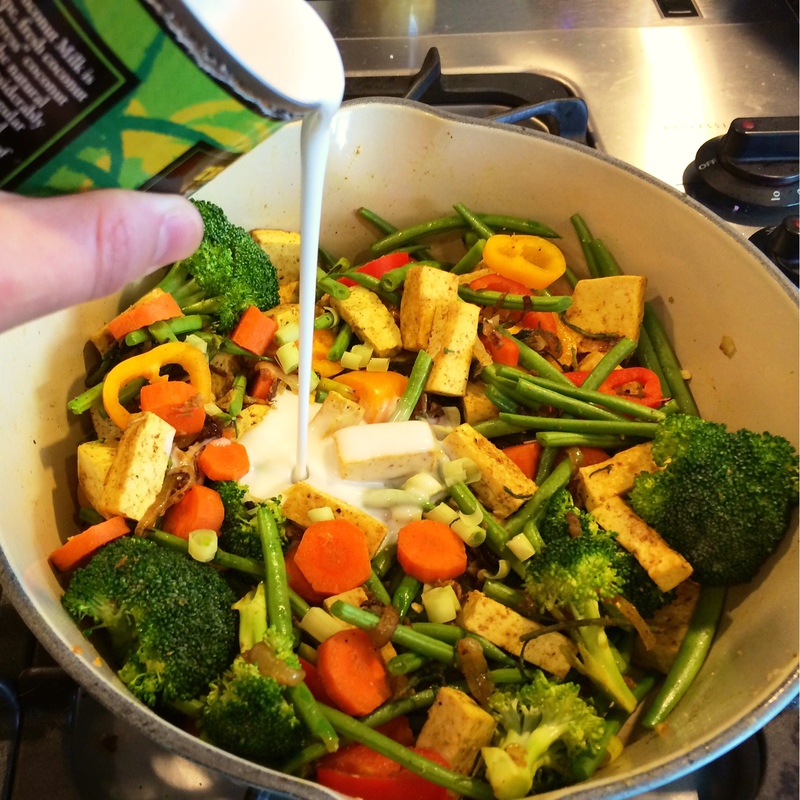 Let the mixture cook down until veggies are soft. If they seem to get too dry add a little chicken stock, but not too much. *NOTE: At this point you can cook some sliced mushrooms in another skillet with butter and add them a little later. After the veggies have cooked down a bit, add about 1/4 cup of flour and mix it around until it is absorbed. It will seem very thick and dry at this point but make sure that the flour is fully mixed in before slowly adding some more chicken broth. This should be on low heat so that you don’t burn the mixture. You will slowly see the veggie/flour mixture thickening up and keep adding the chicken broth slowly to get the right consistency. Don’t let it get too thin because you also want to add a SPLASH of sherry and some heavy cream or half and half to the mixture. You don’t want it to be too dry because the crust will absorb some of the mixture. At this point you can add your cooked mushrooms that are already seasoned and the cut up chicken. Mix this all together and see how it tastes. You may have to add some salt and pepper or even a little butter and mix it up. Place the chicken mixture into ramekins and then roll out a biscuit, puff pastry sheet, or pie crust and place it over the chicken mixture. 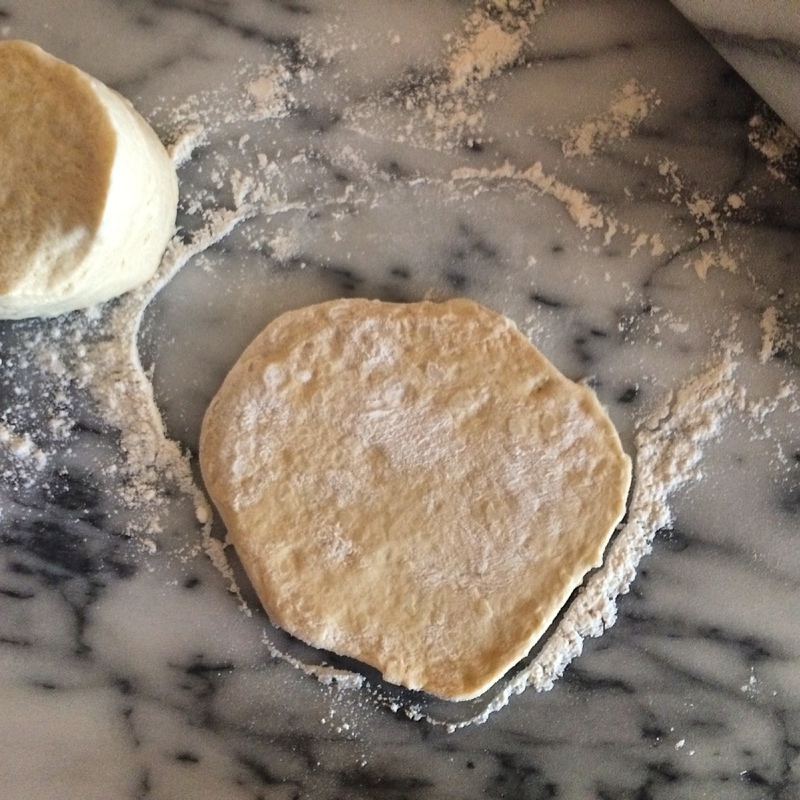 You don’t want a huge amount of dough on top so it is best to roll it out. Make some vent holes for the steam on top of the crust, and feel free to place a little egg wash over the dough so it browns up nice. Place ramekins on a baking sheet and into the oven at about 400 degrees. Cook for about 10-15 minutes, or until the crust is golden brown. 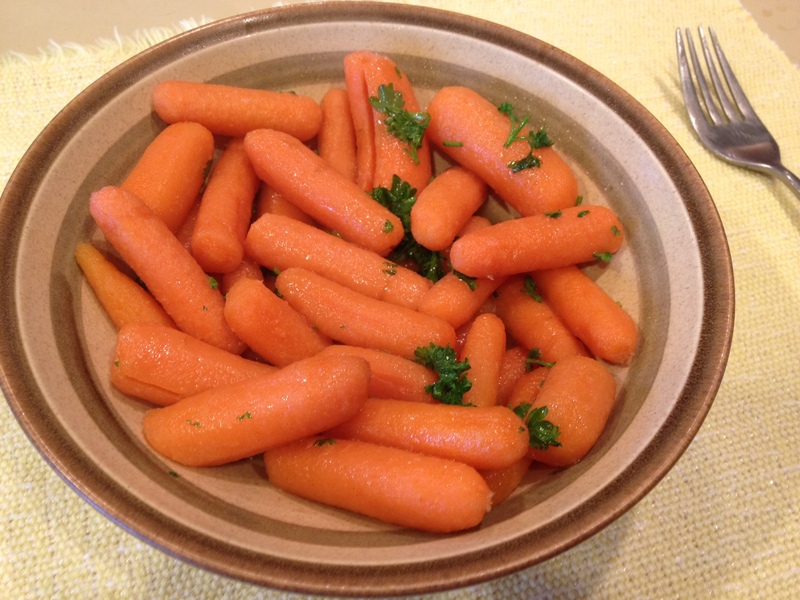 Part of me feels like you can’t bring out the Easter Bunny in you unless you have some carrots, so I served these at the Easter brunch I threw yesterday. Glazed in maple and brown sugar, you can’t really go wrong. They were super easy to throw together ahead of time, I would just make sure you keep them as warm as possible before serving. 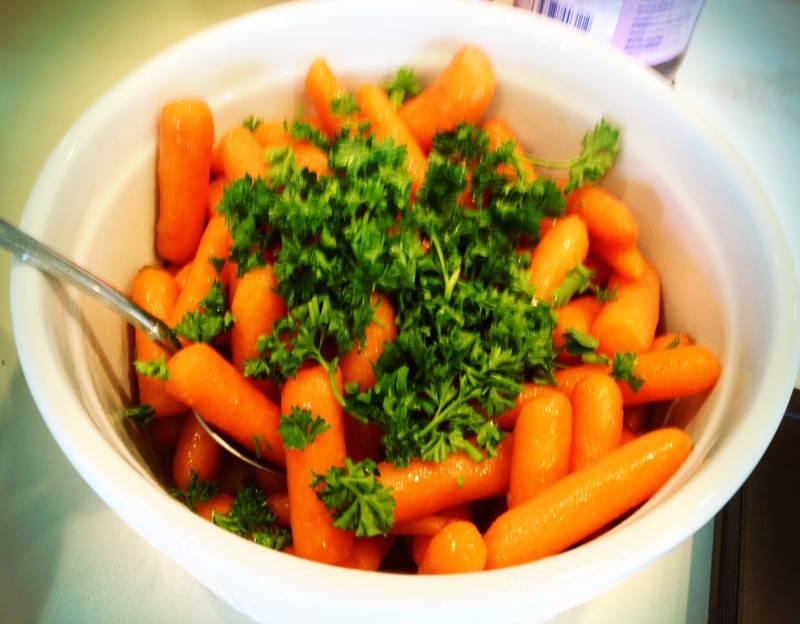 They look like boring ole' carrots...but there's a deceptively delicious glaze on these babies! 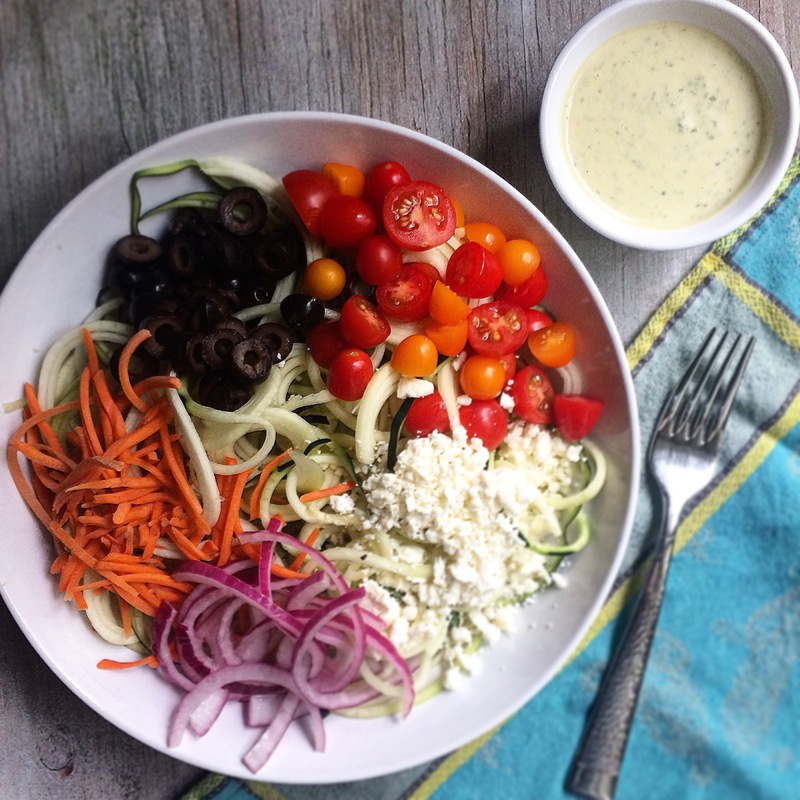 My mom either made this exact same recipe or one similar to it many years ago at Thanksgiving, and it was one of the first times I thought that maybe vegetables weren’t all that bad…This is a gateway veggie recipe. Just an FYI, I halved this recipe and still had plenty as a side dish for 8 people at my Easter brunch. Melt remaining 6 tablespoons butter in large nonstick skillet over medium-high heat. Add maple syrup and brown sugar and stir until sugar dissolves. 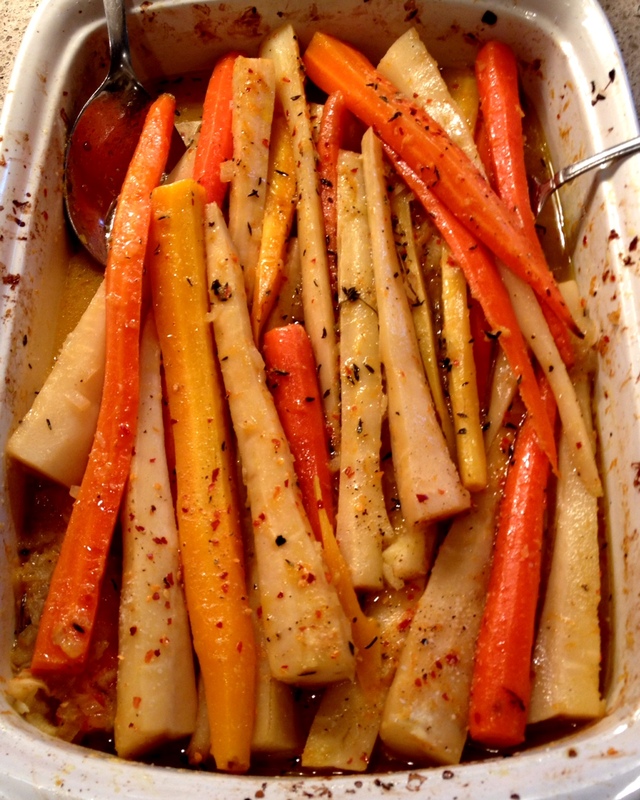 Add carrots and cook until heated through, about 5 minutes. Season with salt and pepper. 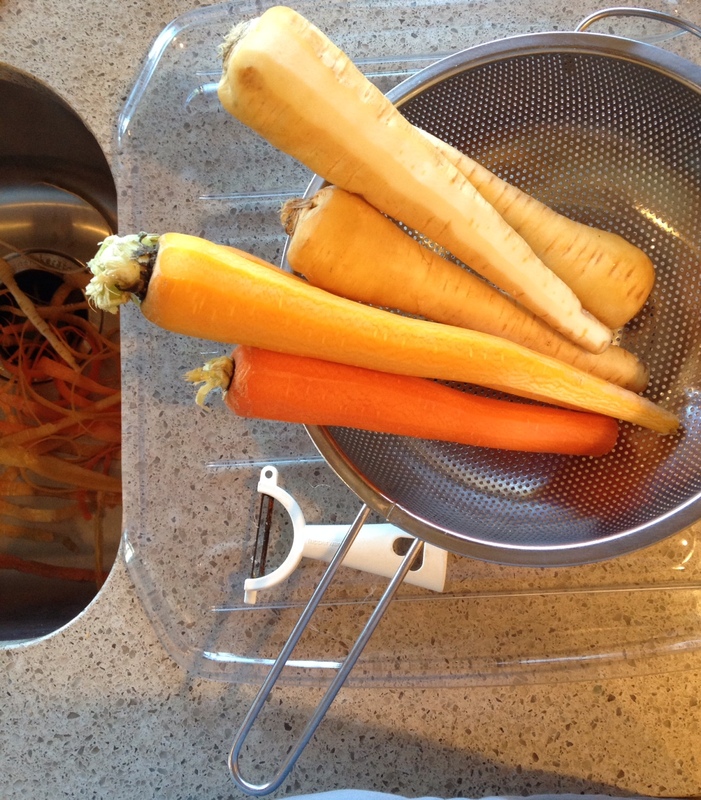 Transfer carrots to large bowl. Sprinkle with parsley and serve. the mound of extra veggies that I thought was a brilliant idea. Looks amazing right now, right? Things went downhill as soon as I added the dumplings and brought everything to a boil. 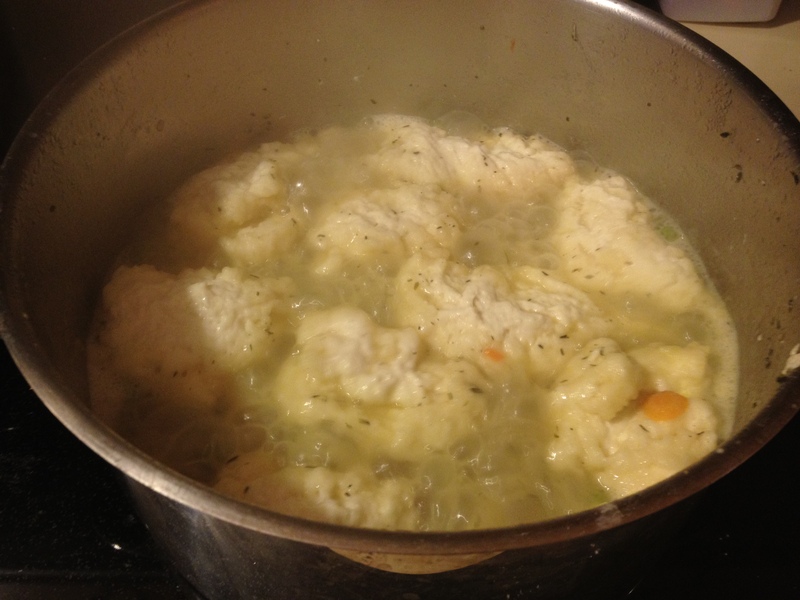 First of all, the dumplings soak up a lot of broth while they are cooking, so having enough is important. 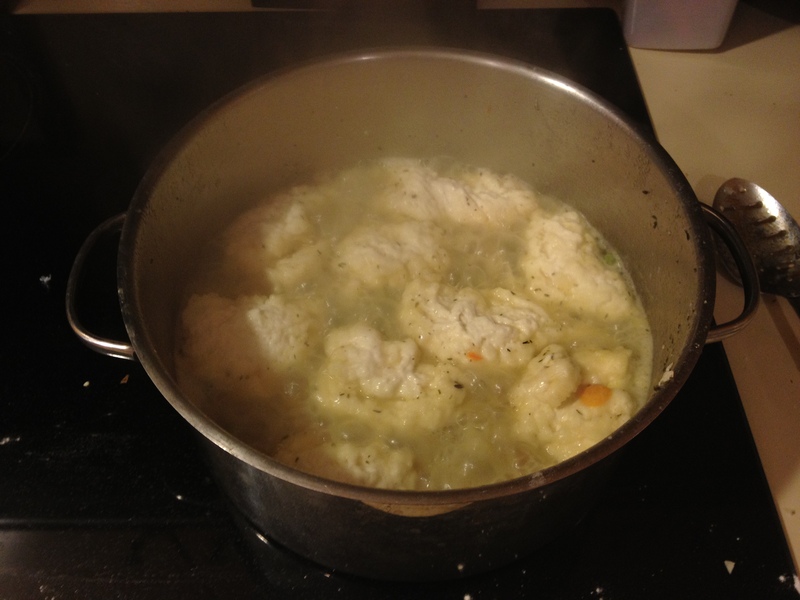 Then, while the mound of veggies were suffocating under the dumplings, I kind of burnt the bottom of the pan…sigh. This was the end product. More of a stew than a soup...not the most gorgeous photo or dish. But I swear it still tasted great! Luckily, the end product still tasted good besides a few burnt chunks that were encountered. The pot I used is pissed though. 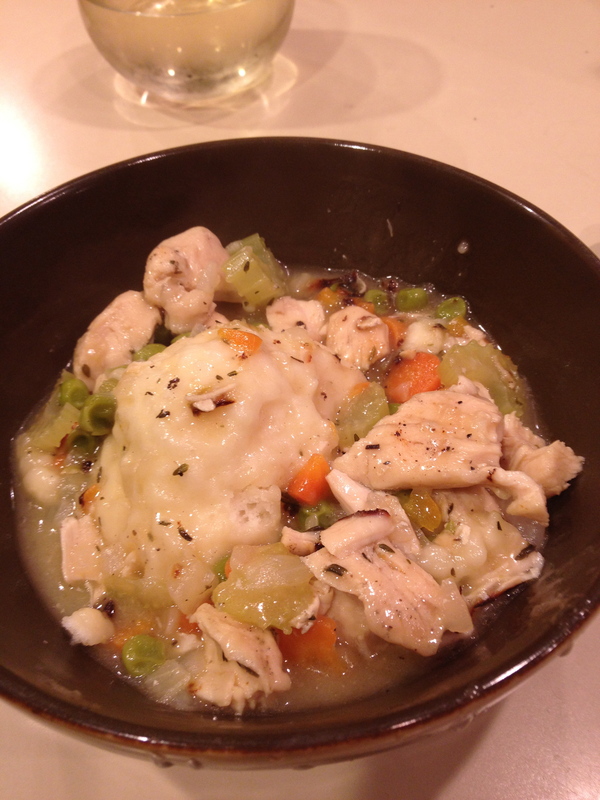 Thank God the friends that ate this didn’t mind a chicken and dumpling stew…We have coincidentally nicknamed the dish “chicken and dumps.” Not because it was bad – just because it’s hilarious. Despite my mistake, this all got scooped up pretty fast. I didn't have time to take a picture after it had stopped boiling...mmm doughy chunks. This is just one of those things I guess – a learning experience. “Winging it” and adding tons of extra veggies wasn’t the greatest idea ever. So, here is the lovely recipe below, and for the love of god, either follow it or DOUBLE it or TRIPLE it…Don’t wing it like I did! In a small Dutch oven or heavy stock pot, preheat the olive oil on medium high heat. Dice the chicken breasts into medium sized pieces and slowly add them to the oil. Add the thyme, salt, pepper and garlic powder to chicken. 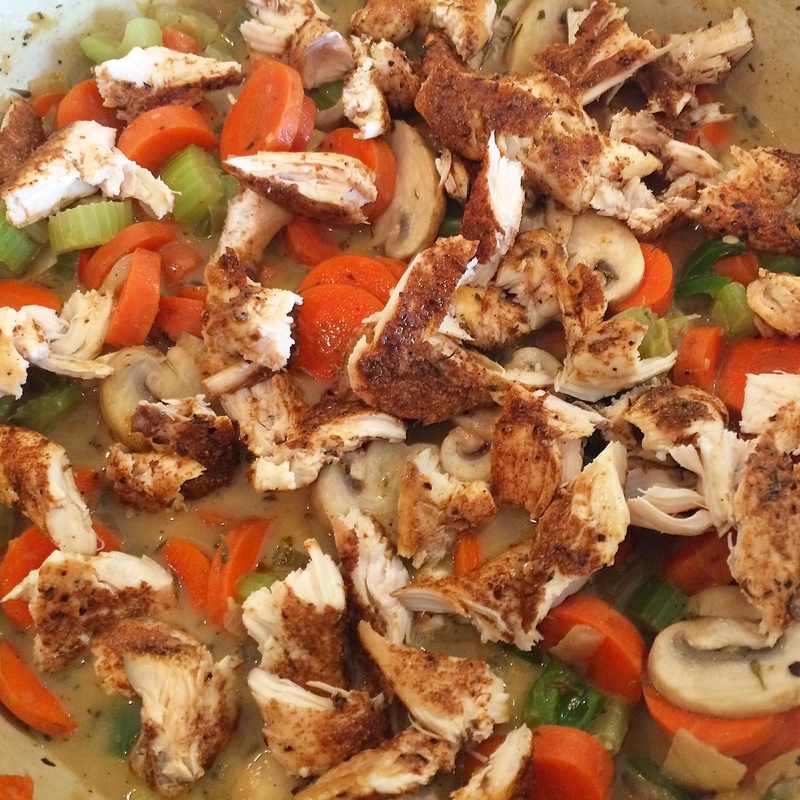 Sauté for 2 – 3 minutes or until the chicken is completely cooked though, but not brown. Remove and set aside. To the same Dutch oven, melt the butter over medium heat. 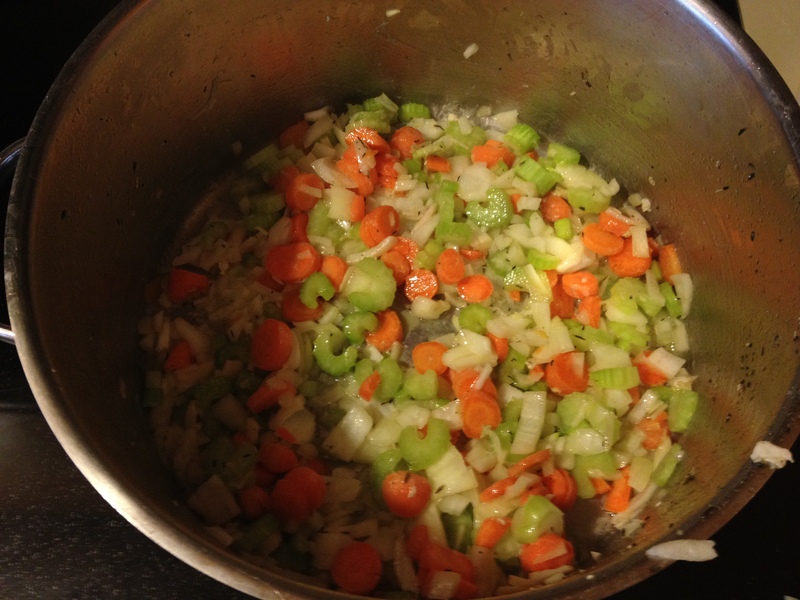 Add the celery, onions and carrots to the butter. Stir occasionally for 4 – 5 minutes or until the onions are slightly translucent. Next, add the flour and stir for 1 minute until the flour has completely absorbed the butter. Stir in the cooked chicken and slowly add the chicken stock. Make sure you stir while adding the stock to prevent the flour from causing lumps. 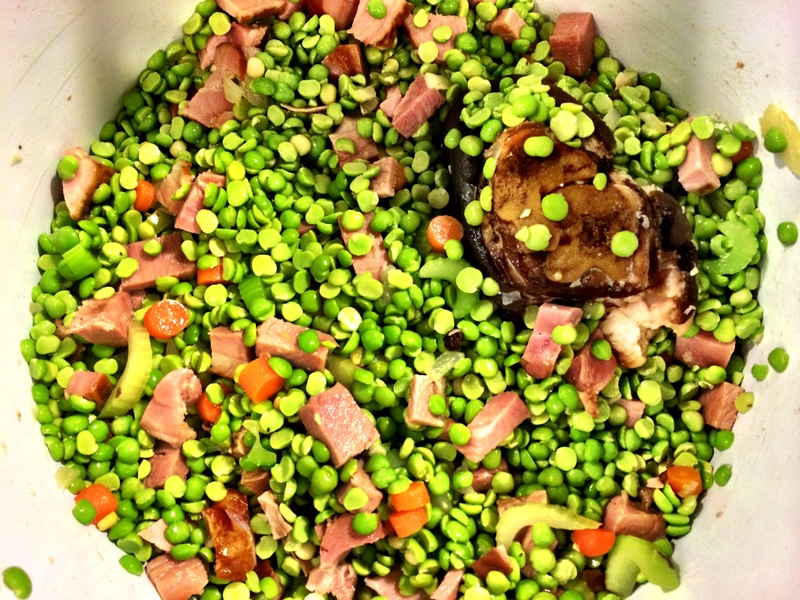 Add the frozen peas to the broth. In a separate bowl, combine the baking mix and milk until well incorporated. Bring the broth to a boil. This is important for the dumplings to steam properly. Drop large tablespoons full of the dumpling batter into the boiling broth. Continue to boil for 10 minutes, uncovered. Cover the soup and reduce the heat to medium low. Cook for an additional 10 minutes, covered.